Even after months of grueling training, lacing up your best pair of running shoes, pinning on your number and racing 26.2 miles will likely never be an easy feat for most. But one way to make a marathon more tolerable is to turn it into a vacation. We’ve compiled a list of six marathons where the scenery in itself is enough to make it all worth it. In these locations, the length of the race is overshadowed by the awesomeness of the place. 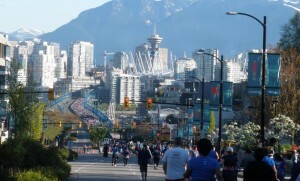 On May 5th of this year, 3,978 men and women ran in the BMO Vancouver Marathon in British Columbia. Beginning in Queen Elizabeth Park, the marathoners raced through seven scenic neighborhoods, across the Spanish Banks, and into Stanley Park before reaching the finish line in downtown Vancouver. On October 9th of this year, runners will hit the icy gravel of Russell Glacier in Greenland to compete in the Polar Circle Marathon. The starting line weaves from two kilometers inland, outward to the ice cap covered in snow and riddled with crevices. The route is clearly marked to avoid the potentially dangerous ice cap pit falls, and reindeer are commonly spotted grazing alongside the runners. At an average temperature of 15 degrees Fahrenheit, the Polar Circle Marathon is one of the chilliest races in the world. From the ice cap, runners are rerouted to a gravel road, leading them through the glacier tongues and moraine plains of the beautiful arctic tundra. As if you even needed a reason to go to Hawaii in the first place? The “Garden Isle’s” famous Kauai Marathon will take place on September 1st this year. Heading north up the coastline of the island, the marathon views are made up of beaches, volcanic mountains and tropical rain forests. The course expands through Kauai’s Tunnel of Trees, through the mists of Omao and toward the island’s beautiful resort beaches. From there, the race spans outward toward the top of Mount Kalaheo before a gradual descent back to Poipu beach, where the finish line and starting line are both located. Just a few weeks ago, on June 22nd, 2013, racers set out on an African safari-turned-marathon. In Limpopo Province, South Africa, situated within the Entabeni Safari Conservancy grounds and private game reserve, runners braved the African landscape for 26.2 miles. Often accompanied by zebras, antelopes, giraffes and other wild game, the runners came face to face with the wild nature of South Africa – yes, they even run through lion pack territory. Noted as one of the most challenging annual marathons in the world, the Big Five Marathon weaves through mountains, valleys, along riversides and lakes, through wild territory and over plateaus. Runners are even advised to keep running – quietly – if they encounter a rhinoceros! Back in May, marathoners braved the course in Tianjin, China, known as the Great Wall Marathon. Because of the steep climbs and descents along the Great Wall of China, this marathon takes, on average, twice as long to finish. Runners are faced with an 8-hour time limit they must reach, and even that is pushing it along this trek. The starting line is located a couple hours northeast of Beijing and heads dead-straight to the Wall. The structure, built centuries ago, roams through China’s countryside before depositing runners into the legendary villages and rice fields of the area. The finish line is located back at the wall for a very fitting finale. Steeped in views of the enormous Redwoods of Pfeiffer Big Sur State Park, the Big Sur International Marathon takes place in April every year. The route leads runners all the way down to the highlands of Carmel, along the Pacific Coast with scenic beaches, ocean views, forests and mountains. The trip down Pacific Coast Highway is commonly recognized as one of the most beautiful road trips in America. Running it is the premise of this race. The terrain is loaded with hills and the trek is not an easy one, but the Big Sur International Marathon sells out every single year within the first 48 hours of open registration.